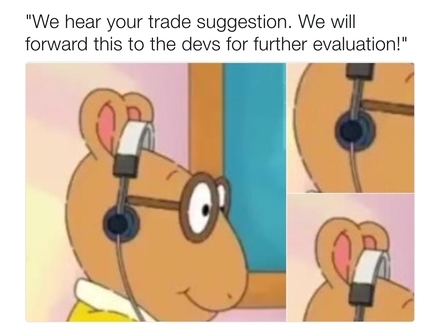 We still get a large number of posts from users requesting a trade feature, so we have copied this thread and posted it to the Suggestions & Requests sub-forum. The original poster (Ace) did a good job of breaking down the reasons why a trade feature is not likely to be implemented any time soon. The original post is below. I'm writing this due to the overwhelming amount of times that people have requested trading to be implemented in Unison League (and I might be writing this because I ran out of AP and am waiting for it to recharge). Please link people to this thread for future reference if they want to know exactly why trading is such a bad idea. This should be comprehensive enough to cover all the major reasons that come up and more. It opens room for abuse by the players. It allows for the rise of real world trading companies and scam sites. It would undermine the source of revenue generated by this game. It would force this game to be less free to play friendly (due to Reasons 2 and 3). Now, let's go over each point in detail. 1) It opens room for abuse by the players. Let's face it. Players are human. And humans always seek to better themselves. Many players will go to great lengths to become better at this game. One possibility, if trading were allowed, would be the creation of multiple accounts. With all the free gems in this game, I can use multiple other devices and create multiple accounts, accumulate gems by completing the early quests, then use the spawns to roll great equipment. Essentially, this is a never-ending supply of gems for any player who has at least two devices (a phone and a laptop, a laptop and a tablet, a phone and a tablet, two tablets, etc.). I've seen suggestions such as "set a level requirement", "set a time played requirement", set a "gear score requirement", or make "beginner spawn untradeable". Those ideas do not work for the reason why the players will go through the effort to make a new account in the first place: the cost outweighs the benefits. I know that I would personally not mind making a bunch of accounts, a bunch of Ateam IDs, and accumulate tons of gems, roll great gear, then wait the prerequisite days, get to the prerequisite level, etc. No problem. I'd rather do that than spend $500 trying to get the gear I want. What about people who can program? What about people who know how to use Google and can find programs/macros for farming? What kind of advantage would they have? Now, I haven't even mentioned scamming and hacking as a form of abuse. With the ability to trade also comes a new method to become good at this game: the expense of other people. People will suddenly have the motivation to scam and hack other players in order to get further in the game. This will then require additional staff on Ateam's part to moderate this form of abuse, which costs extra resources. Currently, without any way to transfer wealth and gear, there's little motivation to scam or hack someone else simply because the time put in will not reap any benefits that would make the effort worthwhile. 2) It allows for the rise of real world trading companies and scam sites. Player is frustrated that they cannot get powerful gear or the specific gear that they want. Player seeks way to obtain this gear easily on the internet. Company offers to sell the player the gear they want for a monetary price (AKA real life $$$). Most likely, this monetary price would be cheaper than what it would cost to buy gems and spawn for the item. The company uses their vast resources, such as their huge number of employees to make tons and tons of spam accounts or code bot accounts, get the gear that the player requested, and trade it over to them for a real world dollar price. Player gets the item they want, the company gets the money, and most importantly, Ateam does not. Player pays the company to trade over the item that he/she is looking for. Company scams the player and does not give the service and keeps the money. Ateam becomes involved in legal cases of fraud. This is easily the most important reason why we do not want trading to come to Unison League. Sure, these companies won't rise right away because Unison League is such a small game, but as it grows, it will attract the attention of entrepreneurs who want to make a quick buck. Again, level/GS/time restrictions on trade do not work, especially on these companies. Their employees are paid to get the gears quickly. They can easily get to the required GS/level/rank and they can probably get there a lot faster than you. In tons of the RPGs that I have played in the past, many of the Real World Trading Companies owned a lot of maxed out, top ranked accounts that were filthy rich in money and gear. This is not a difficult thing to do for a company. Don't forget that botting accounts are possible if they have enough coders. These companies can easily get hundreds of accounts to max level and get thousands of SSRs, ready to be sold for a cheap price. Nobody will spawn ever again. With the option to buy your items, this game will essentially be the very definition of "pay to win". Anyone with money in real life can get whatever they want in this game. 3) It would undermine the source of revenue generated by this game. This reason is pretty big and is the reason why we probably won't see trading. This game makes money BASED on the fact that gems spawn items, and items are random. If we allow for trading, the randomness of getting gear would disappear. Suddenly, it becomes irrelevant whether you got lances and swords as a cleric. You simply can trade those for other gear. Ateam will generate significantly less revenue due to this fact. We already have a significant free to play population as it is and if trading were possible, the pay to play population would almost cease to exist, as paying money does not give a large enough of a significant advantage, other than AP recharge or item space. 4) It would force this game to be less free to play friendly. Normally, games charge money to players for access to more content, for greater ease of progressing in the game, and other benefits. Please notice how this game gives 100% access to ALL content to ALL players, regardless of whether they pay money. They only make money from gem purchases. With trading, a huge incentive to buy gems goes away. This cuts deeply into the revenue that Ateam makes. Also note that real world trading companies will act as a "competitor" for the same player base that Unison League has. This further reduces how much money goes back to the creators and staff of this game. 1) Content areas that are restricted to non-paying players. There will be maps, event bosses, gear, etc. that are only restricted to people who pay money. 2) ​Less gems given to players. Let's face it, if one can easily get the gear that they want by trading something using the free gems that they got from earlier on, Ateam's easy solution is to NOT give as many gems to players. If they are going to trade items anyways, make them pay for gems in order to get items to trade. 3) Reduced rates of items appearing. Are you frustrated with RNGesus cursing you with 1 SR for every 9 rares? Well it's possible that Ateam might make it 1 SR for every 99 rares. If one can easily trade the items we want, it's a possible solution to make the items in circulation more rare in order to encourage more gem-buying. Many of you are probably thinking now: these theories are made up by you. Yes, they are. But we can't deny the fact that trading reduces how much money goes back to the game. These are all possibilities that will offset the loss of money that Ateam can implement. All these sound terrible right? Well the people who make the game need to feed their families and provide roofs over their heads somehow. If something reduces the money that the game makes, there has to be something to balance it out. Gaming companies just can't lose thousands of dollars over night and be okay with that. Why people want trading: We shouldn't punish all the players for something a few players will do. Why this reason is bad: You underestimate how many "bad players" are out there and are overlooking the consequences trading will have to this game. You're also ignoring the fact that this is less money for our game creators and we need them to make the game happen. Why people want trading: I spent $1000 trying to roll for the items I want and I keep getting useless rares, duplicate items of items I already have, or items that don't work for my class! Why this reason is bad: There are tons of other solutions to fix the above that don't involve a trading system that would break the game. Also, that's how Ateam makes money! You're willing to spend that much just to get virtual pixels. You don't NEED these pixels in the grand scheme of life, but you're still willing to dump all that cash for it. Sounds like a "you" problem. Why people want trading: It makes the game more interactive. Why this reason is bad: A lot of things can make the game more interactive. Having people spam "TRADING LILITH AND GREEN VALK FOR KIRIN@@@@" in the lobby is not what I call "interactive". Why people want trading: It's still a good idea and we can just charge gems to trade. Why this reason is bad: What will this price be? In the end, it still has to be a reasonable price to be welcomed by the community and used enough to justify the game update. This price likely will still make the game less money overall. And again, Real World Trading companies can spare money to buy the "Great Value Gem Packages" in order to charge large amounts of money for items and many unlucky/lazy players are willing to pay real world money for guaranteed great gear. Why people want trading: What about an SSR for an SSR or something of equal value? Why this reason is bad: This assumes that all SSRs are created equal. With the game's power creep, the earlier SSRs are heavily outdated. We have many great new gears with higher cost, better skills, and better utility. This "SSR for an SSR" idea does not work because of this. You'll still get useless SSRs traded to noob accounts for much more OP gear. Why people want trading: What about only letting people trade a limited amount of times? Why this reason is bad: What is this arbitrary limit? How does this address any of the reasons why people want to trade? Eventually, this will become unsatisfactory and players will demand that the trade limit be increased. What if this limit eventually is used to make money off the players if Ateam isn't making enough money off spawns? They can charge a trade limit increase for 200 gems. Doesn't that sound like a nightmare? Why people want trading: This game will be a lot more enjoyable and successful with trading. Why this reason is bad: No, it won't be. Experience beats speculation, in this case. I and many other players have seen this happen way too many times. Imagine a game filled with scammers, hackers, website advertisement bots, and gem/gold farming bots. You will see people trying to scam or hack new players, driving them away before they can get addicted to this game. You will also see a lot more bot accounts. There will be bots advertising real world trading websites, bots advertising scam/phishing websites, and bots needed to farm gems/gold for those companies. Then, because of all this, many players will quit and the game dies. Why people want trading: I still want a way to give away and get gear from others. How about we do an auction house instead? Why this reason is bad: What would bidders use to bid on? If they use gold, it can be easily abused to transfer powerful gear to noob accounts. If the auction system uses gems, this can easily be abused as people will put bad items for large amounts of gems, then make noob accounts, get the gems from the early quests, and bid on the bad item, thus transferring the gems to the main account. If the auction system uses other items, then there's no difference between this and trading, so see above for why trading is bad. tl;dr: Trading is a terrible idea and would ruin the greatness of this wonderful, free to play friendly game. If you have any counterarguments to my points, feel free to post them here, but I am confident that I will have a reason to counter yours. The ONLY possible way of trading that could be implemented is if an "exchange" system were made that involved the gaming system making the trade between random players, so that the trade cannot be planned between specific players. Otherwise, trading will likely ruin the game in the above listed ways. Thank you for taking the time to read! Again, feel free to use this thread as a reference or post the link if you want others to understand the cons of a trading system. If you have anything to add, please also tell me and I will consider adding it! Happy gaming! Last edited by Ace; 02-24-2017, 10:33 PM. Way to go bro! Have a cookie. One thing you did a good job mentioning several times that we'd like to reiterate is that we think several of the user complaints often brought up along with requests for a trade feature can be addressed in other ways. Another Ateam title, War of Legions, implemented a trade system that addressed each of the issues: trades are done with random players, trades can only be done for units of equal rarity, there is a charge for each trade, there is a level requirement to access the trade feature. While the trade system IS used, most people use it begrudgingly, and there was a large outpouring of vitriol against the system when it was implemented. The majority of players don't want to pay to trade items they've already paid to Spawn, and they often want to trade with their friends (or, "friends" -- it's entirely possible they're selling units for real money). At present, the Unison team has decided that no trade system is safer than a system that could potentially be abused or drive away the community. Dark Summoner was another prime example. I won't list names but I have seen many hackers and scammers within that game. In fact, I've seen all of the above in that game. Excellent job Ace. 100/10 I totally agree. I've been around many an app game and I can tell you that trading makes drastic changes to the game scene. I actually was one of the few people that played Dark Summoner (another ATeam release) when it JUST came out in the app market, somewhere around 2011/2012 timeframe. When trading WAS introduced the following happened. -People were asking for outrageous prices for certain monsters, at the time the ranks were C-A+ with people asking for potions (refilled energy as was the trade currency) for 99=$99 for their items. Ateam DID try really hard to get the situation under control, but by the time it was released IT WAS TOO LATE. I haven't tried the revamped version of Dark Summoner to know what changes were made with the new iteration, but with what happened to the older version I'm kinda on shaky ground, plus I'd have to start anew since the number identification system used became obsolete. So for anyone that thinks that Ace is wrong, he is TOTALLY CORRECT. Take it from someone who's lived through multiple apps that made the same mistakes. Just wanted to back up what Ace said.. I've seen other games become unfun after trading or gifting is implemented. Actually, to be more clear, it becomes unfun for the non-abusers and becomes really fun for the abusers because now you can get anything build/gear you want if you pour enough time into circumventing the trade requirements. The reason it becomes unfun for non-abusers is because you start to see people who are geared to the max and it's one thing when you know they paid for it, but if you know that they cheated their way there, it won't sit well for you (non-abuser) and you'll end up quitting and claiming that the game is overrun with cheaters and abusers. revenue and their players. I wish this post would shine a light upon this said suggestion by most of the players. Good job Ace for reiterating this to those who do not know the negative effects. Remember this words of wisdom (from me of course): "Either games kill boredom or boredom kills the game." "Why people want trading: I spent $1000 trying to roll for the items I want and I keep getting useless rares, duplicate items of items I already have, or items that don't work for my class!" Also: in case people haven't noticed, switching class is free, and you'll probably finish what you need in your first tree by level 60. There's another twenty levels until you cap out and lots of proficiency to spare. So you invest in a second tree. Most guilds do not have two of each class. My guild only had one healer. What happened? Our paladin invested in the healing tree and made use of the books she had. We're against a guild with 7/10 lancers? Someone switched to archer class and used bows. In other games, you either have to RESTART a game/character or PAY to switch class (Nevermind that in other games abilities are learned with limited points earned via leveling up. This game you can learn all the skills with enough time). And if it's not obvious that your equipment is flexible, then this: paladin spawns lances constantly. One of them has a fatal testament ability. Fatal testament is not ability-specific, and lances give patk. Why is this not an acceptable substitute? Archers can't get bows? Well grab a book and lance; I've seen lots of archers carry healing spells anyway (Heart of Recovery/Generosity from books). Lancer with a ton of staffs and books? UL is telling you it's time to switch class. With so much free content and flexibility, you're bound to find a way. Home is where the heart is--with family and friends. A rarity restriction would probably introduce more outrage than fix any issues. The majority of the "loud and proud pro-traders" want it to trade their SSRs and URs. Implementing something like this is just a further slap in their face. Might as well be fair and not have it. Nevertheless, you would still run into the same problem, just earlier on in the game. There are still SR's that can be reforged into SSRs that are really valuable, like Wind Hero. Everyone can claim to want to trade stuff for "cosmetic reasons", but the rarity restriction doesn't erase any of the problems that would come with the introduction of a trading system. sorry for my english i know is bad sometimes. The sad part is that there will still be tons of players that neglect the downsides of having a trade system and will continue to demand a trade system. Perhaps a auction house with all random gen anonymous lists shown so you couldnt pin down a specific person to trade. Also making it impossible for someone who buys gear off a site to even have the transaction in the first place additionally making scam sites useless and the two device trick pointless aswell. As Fenrir already stated, are you willing to work for free? If your answer is no, then your post is irrelevant. If you are worried about a loss in your own revenue, then don't play premium games. It's not meant for you. Ace If it was ateam, and I had another job already Hell yeah I would work for ateam for free.